Can soundbars challenge 5.1 surround sound? Endless reams of untidy cabling are a mainstay of most multispeaker sound systems, whether they're 5.1 or the more space-hungry 7.1 specifications. These setups aren't ideal for anybody without a capacious lounge that features a pretty standard layout. Unfortunately, the whims of modern architecture mean that stereotypical retail showroom interiors are few and far between, making setting up surround sound systems accurately a difficult issue. To get round this, manufacturers produced soundbars – devices incorporating five channels into one bar that can be placed above or below a television. Many consumer electronics makers have spied the emerging market for clutter-free speaker solutions and jumped on the soundbar production bandwagon. There are two main solutions on offer. The cheaper option simply provides stereo sound, which offers a clearer and more defined alternative to your television's standard built-in speaker. These models are generally active rather than passive, which means that the amplification unit makes up a portion of the device's interior. As a result, there's no need for a separate receiver or amp, and you'll reap the rewards of improved sound in an eye-catching, streamlined setup. More expensive soundbars dole out engaging aural effects with the sole intention of placing you in the centre of the on-screen action, whether you're watching a film or playing a game. We'll be focusing on a soundbar with a virtual surround sound feature-set here. The downside of their compact size is that soundbars are only able to offer frequencies at the higher end of the audio spectrum. The cabinets are simply too small to produce full bass. For a more complete full-range of sound, an additional sub-woofer is required. While most products are sold without a sub, some do include one as part of the package. However, manufacturers don't just bundle an array of tweeters into the device's casing haphazardly. No, they're cleverly engineered so that the loudspeakers combine to give you the impression of an all-encompassing auditory envelopment. 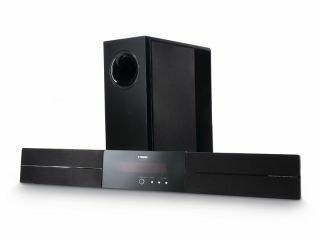 Although the soundbar is more convenient for use within a compact room than a normal surround sound system, it still requires some form of uniformity in the layout. The devices are at their best performance-wise in a square room where the rear wall is closely behind the back of the sofa you're parked on. The system then beams sound around the room and deflects it off walls to create virtual surround sound. In addition to this beaming, a more complicated method that harnesses some of the fundamentals in psychoacoustics (the study of how our ears perceive sound) is employed. Tiny adjustments to volume, time difference and frequency mean soundbars can create effects that equate to noise sounding like it derives from a different direction. For example, when a sound originates on the right, it's louder in the right ear. Our brains are able to work out where the sound comes from by the delay in it arriving at our left ear. The time it takes to travel the width of our skull is mere thousandths of a second, but it's enough. The psychoacoustics employed by soundbars simulate exactly this. One of the reasons that we're able to pick out sounds emanating from the rear is that the outer-most part of the ear filters out a selection of frequencies and decreases the volume from sounds that are behind us. When the integrated sound-processing encased in many soundbars removes those frequencies and also lowers the volume slightly, our brains are fooled into believing the sound is coming from behind.